Hey guys! Jan Rey here again! 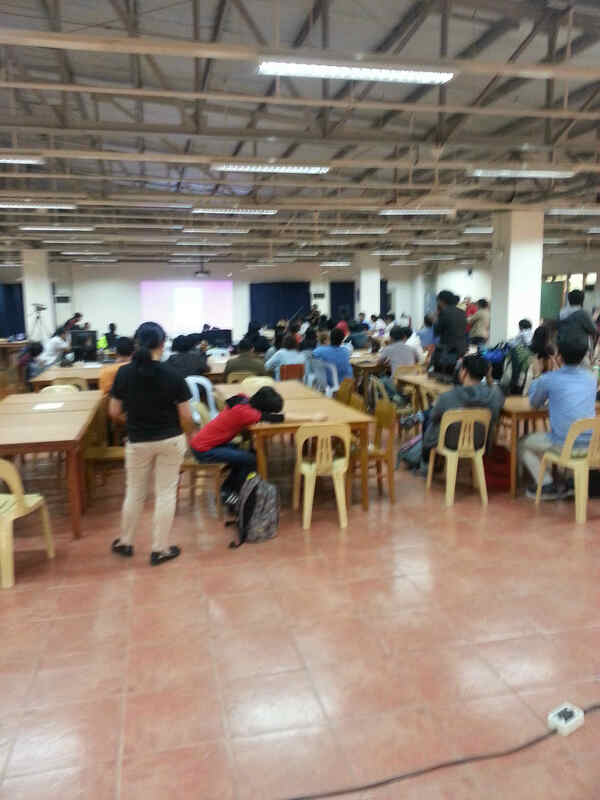 The Manila Game Jam 2015 has ended, and it was a lot of fun. Several of our co-workers here at Altitude also joined the game jam, and in this blog post, we highlight their thoughts and experiences as they went through the process of creating their games this year. So without further ado, Joniel, Aileen, Erwin, and Benjo takes us through their own game jam journey this year. How long have you been joining game jams? This is my second game jam 🙂 My first game jam was just last year. How many hours of sleep did you have this year? I slept 4 hours the first night, and 2 hours the second night. I didn’t feel tired though, since I loved what we were doing. 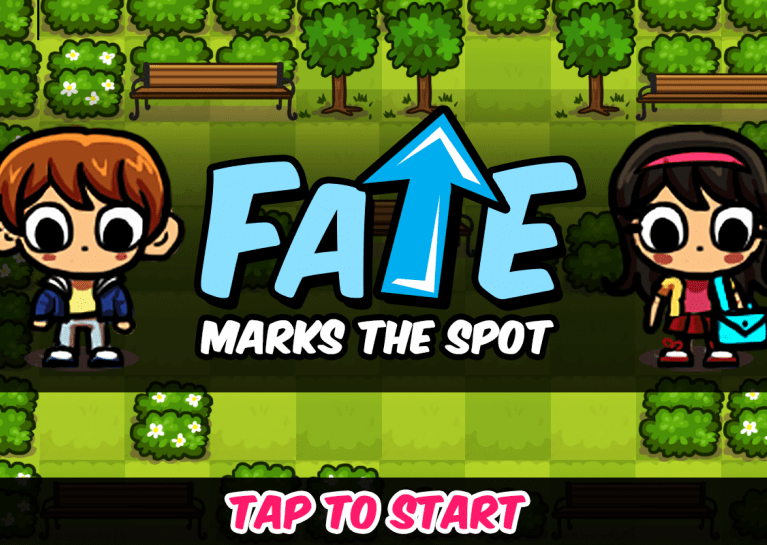 Our game is called “Fate Marks the Spot.” It’s a top-down puzzle, where you act as fate to bring a couple together. 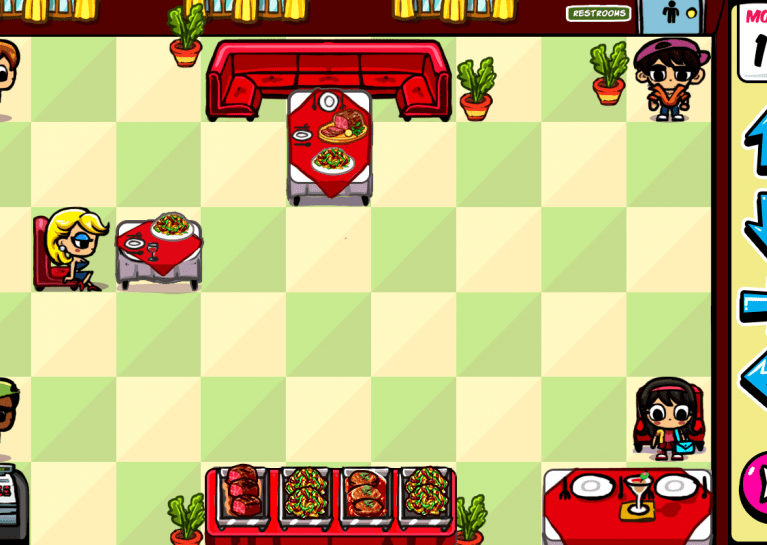 You can download our game here. What’s your favorite part of this years’ jam? My favorite moment would be the last minute countdown before the game jam ends, and how our team did a photo-finish. We all shouted, “Good job, team!” to one another and did a round of high fives. Did you finish your game? Yes, we did 🙂 We had originally planned a tutorial + 2 more levels, but we cut the final level out. The group agreed that we had to cut the scope short when we realized that we may not meet the deadline. The basic goal of the game was to not be forever alone. 1. Communicate with your teammates. You’re just given just 48 hours to make a game, so planning and preparing your schedule is very important. If you have a question, ask it right away. If you have a concern, voice it out. It will help everyone know how each aspect of the game is going. 2. Know your team’s limitations. Plan your scope. If you want a 3D game but only have a 2D artist in a team, then it’s not going to happen. 🙂 Plan around your team’s strengths and what they can do. If your team only has 1 programmer, ask him or her if it’s possible given the time. If he or she isn’t confident, then either compromise or think of another workaround. Game jam isn’t a contest. The heart of game jam is how it brings together people from all around the world to make games. It’s about having fun, so don’t let stress get to you. Enjoy the experience and learn from others. Joined my first back in 2013, where my team earned a “Technical Excellence Award” (http://2013.globalgamejam.org/2013/pound-pound-i-dont-want-diet). I haven’t missed a Global Game ever since (2014 game — http://globalgamejam.org/2014/games/2e52; a game I made with fellow Altitude designer Benjo and fellow Altitude developer Erwin and other mutual friends). I slept for around 4 hours on the first night, then 3 hours on the second. My game jam partner and I were more chill this year, but we seem to had gotten more stuff done this year. unity skillz+10! My friend and I decided to go the experimental route this year and make an experiment with what we thought was an interesting mechanic (or at least what we thought was interesting) — simulating ant behavior (specifically their movement), their tendency to follow other ants, and how they react to temperature and obstacles. Ant behavior simulated in code. What will they think of next? 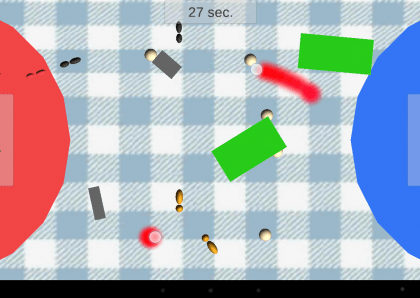 The game is a multi-player game that can be played on one device (preferably a tablet or a phablet). The game spawns ants that move straight, unless obstructed. You create “hotspots” on the board by swiping, causing temperature to rise wherever you swipe. The ants avoid these “hotspots”. The object of the game is to manipulate these neutral ants to get food (spawned randomly throughout the map), and then carry the into your “colony”, which is on the opposite side of you (kinda like football, or basketball). I really liked the venue. Being isolated from the real world (because of the venue itself and the security constraints) was something that helped us focus, I think. Yup! My game jam partner (who I have worked with many times before) and I worked faster and more efficiently than ever. I think we wrote just as much code and designed more stuff than last year’s game jam at ¾ the time and 1/3 the man-power. Get enough rest. Your productivity decreases exponentially when your brain is somewhere in the Outer Realm. Network well. My friend and I are snobs, but we could have used 2 additional pairs of hands for design and art. Same as the 2 previous years, about 4. That 4 is the straight one when I pass out in the afternoon for staying up all throughout the night (and watching everyone else take all the sofas), with some intermittent power naps in between usually accompanied with my keyboard kissing my face. Fun times. Okay, so like and unlike the previous GGJ’s, our team finished an unfinished mess. Best one by far that I ever worked on in GGJ was our 2nd, as it was the most finished unfinished product I ever had a hand in. This time however, due to some problems, we didn’t manage to finish much other than a basic prototype. With that said however, let me talk about what is SHOULD have been. Error 404. Wife not found. 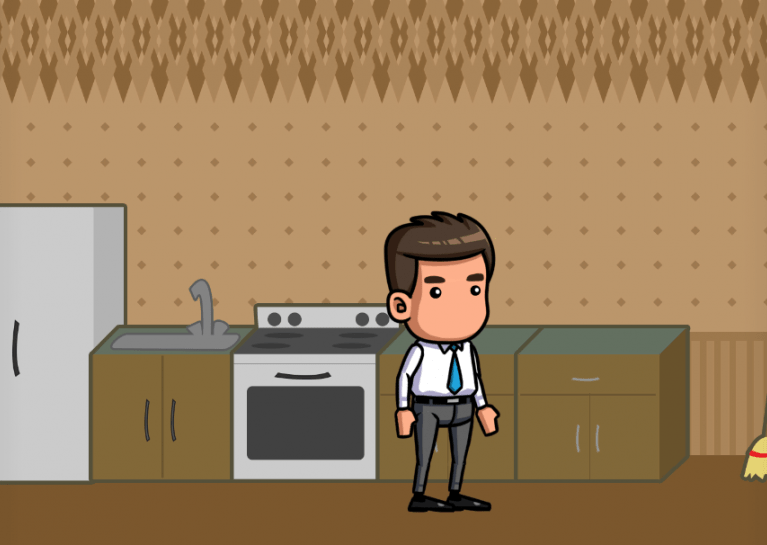 ‘The Angry Wife’ would have been a side-scrolling point ‘n’ click puzzle game. The premise: You as a regular salaryman come home from work and find your wife angry at you about something, and you must figure out what it is and do something about it. The mechanics were to be a point ‘n’ click puzzle game using only the clues strewn about your home to solve the puzzle of the reasoning behind your wife’s temperament. There would have been multiple scenarios and objectives (even a Baby! ), and different house configurations would hint at different solutions, with branching solutions that also have a rating in the end, meaning you could solve it, but you could either solve it well or vice versa. Whether that was a good idea or not remains to be seen, as we didn’t get a full enough build to properly feel out if it would have been fun or not. But hey, it’s about the ‘Experience’, and boy did we get a lot out of that one. Everything else that are my favorite parts (the people and the unbridled chaos) are still the same from past GGJ’s, but the stand out of this year was the venue. I think it boils down more to personal preference, but it was waaaay more accessible for me due to how much closer it was to where I live (Katipunan vs. Makati, wooo). Otherwise, the food was good (catered instead of mass Jollibee/KFC ordering) and the area was wide and open. Also felt much safer, due to the upped security staff (that’s Ateneo for you). Reiterating, no. But, again reiterating, it’s still waaaaay more about the experience you get. Nothing beats the best (or the worst) out of you like the immense pressure and atmosphere of a game jam. Life is a lesson. You learn it when you’re through. Get your ideas straightened out early, and I mean as early as you can. A game jam does not call for an amazing idea in 48 hours (it can happen though). Think of something, prototype it, then evaluate. Don’t juggle ideas unless you are absolutely sure you can prototype it fast enough to leave you with enough time to finish it should you push through. You’d be better off with something possibly less fun but with enough leeway to improve or adapt rather than leaving a half-baked idea in the dust when time’s up. Bring a blanket/thick jacket/pillow. This is more for those that share my style of not leaving the premises for the whole duration, but I still say it to those who choose to leave and go home for the night. So far, every venue has been cold, and I mean cold. It has to be, lest the sheer number of sweaty developers and machine in play burn the building down. And after hours of coding/art/design on your chair in your table/station, you will feel the chills. Have something that can keep you warm unless you want your brain to freeze (figuratively and literally) making you lose valuable time. Last and definitely not the least, accept your mistakes and move on. If you were working on a script that you then realize is either completely broken, unnecessary, or conflicting with a partner developer, scrap it, accept it, and move on. If you make a sprite sheet, and then the design calls for a new sprite sheet because your designers say that the game won’t work unless the character can change clothes, adapt, accept, and move on. If you have to remove entire mechanics and/or level design you’ve been making for hours for whatever reason, accept it and move on. If you get to the end of the game jam without much to show for it, look at what you have accomplished (you always accomplish something or other, no matter how big or small), accept it, and move on. Don’t bog yourself down on what could have been, but be proud of what you did. Game jam are great for creating connection between you and those who share your passion, and that can’t be wasted of what-ifs. This is my third year of joining jams; I started with the Global Game Jam 2013, then Global Game Jam 2014, then Global Game Jam 2015. I got hit with stomach flu smack dab into the jam, so I couldn’t skimp on sleep or rest — I went home each night of the jam since I lived pretty near the venue. In line with this, I personally advise against skipping sleep. Getting enough rest is important to keep yourself motivated, creative, and happy, and those are important in making sure you can make the game you want within the limited time. Our game is supposed to be about figuring out how to keep your wife from getting angry every time you go home from work. The game we submitted is about clicking three trash cans to fill them with trash, which somehow makes your wife extremely happy. As one could probably discern, we weren’t able to put in all the features we hoped to make. The people and the games they made! Since I’ve been attending the GGJ consistently, I’ve seen how the people attending the event have gotten better at the craft. 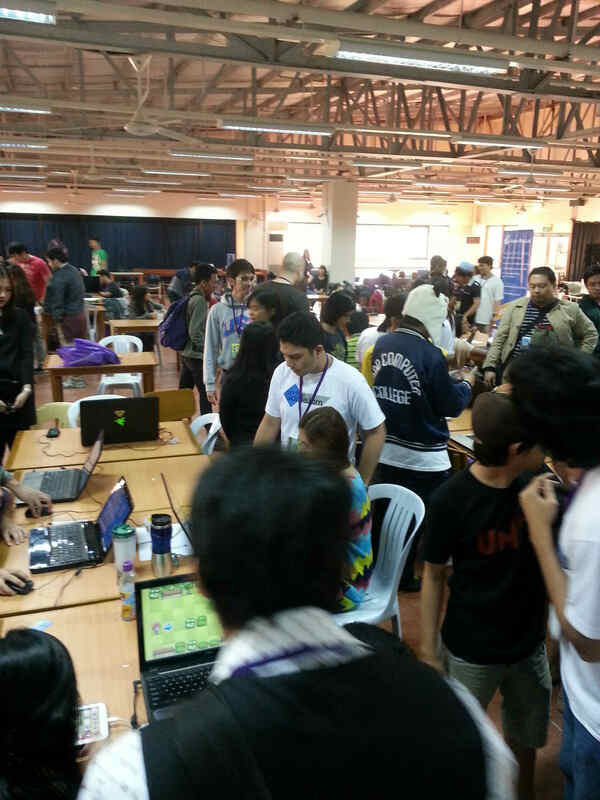 On the site I attended (in Ateneo), the quality of the submitted games amazed me. Most of the people were no longer fumbling around on what to do, and many newbies had a lot more knowledge than we had years ago. Seeing old and new faces alike excited me, and, really, seeing a hundred or so people in a big venue making games is just darn awesome. It’s not just about the games. It’s about the people making them. 1. Plan wisely! Take into account the size of your team and their skill levels when assigning tasks and planning how you’ll spend the 48 hours. A good trick on estimating task time is: take your best estimate — and double it. Think that a feature would take 2 hours to complete? Assume it takes 4. 2. Get some sleep! Chugging down energy drinks and coffee is not a good idea, and will most likely lead to bad code, bad decisions, and a bad time in general. 3. Have fun! Remember that this is a jam, not a competition. Learn new things, enjoy the venue, and talk to people and make friends! As that cheesy high school-themed song says, you’re all in this together, so better have fun with them while you’re at it!